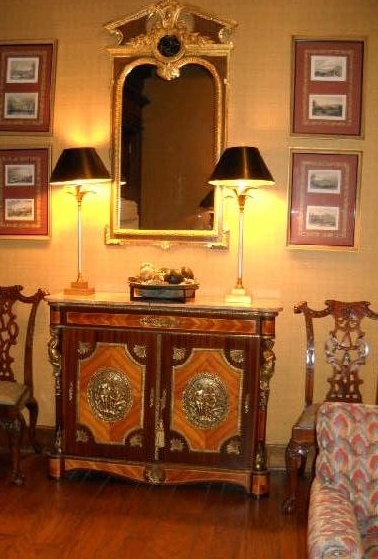 Affordable Accoutrements: Estate Sale at Casa De La Pradera! If you've visited Affordable Accoutrements before, you're aware that I enjoy setting tables that incorporate (mostly vintage) items I've purchased at local estate sales. There was a particularly interesting one last Saturday. It was advertised on estatesales.net as a "majestic palatial gated old world stone, stucco, and brick English Tudor located in the countryside of historic Brownsville, Tennessee in Haywood County." That sounded appealing, and then I read this, "We have yet to open the silver & china vaults. More pictures along with the details & descriptions concerning the contents will be forthcoming." This was the first time I've encountered an estate sale that offered shuttles from the parking area to the house. I might have quietly said something along the lines of, "WOW!" at this point. No, I can't allow myself to be distracted from the reason I'm here! The first room. This photo is from the estate sale listing. Imagine it filled with people lined up to pay for purchases. Now I could get accustomed to a dining room like this one! Sorry for the poor image quality. Naturally I asked permission to take photos, and I turned off the flash to avoid disturbing other shoppers. 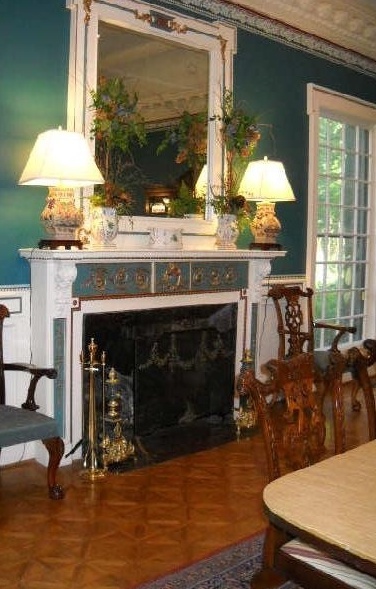 I wonder ... could a fireplace make a dining room as grandly-scaled as this one seem cozy? I found the photo below online. 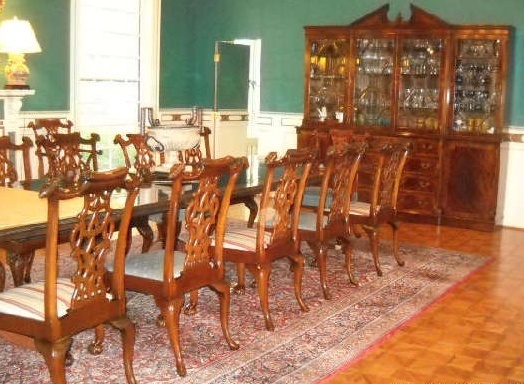 It shows the room before the crystal and silver were priced and displayed on the long table. The massive china cabinet holds Waterford crystal. A couple purchased all the Waterford just as I walked into the room. Back to the day of the sale. Lots of leather. I sat in one of the wing chairs, and it was really comfortable. The door to the left of the firplace leads to one of two kitchens that flank the dining room. The screen was $395. On the first day of estate sales, prices are usually firm. If it's not something you're absolutely determined to buy, it can be better to come back the second day and ask for a discount. The risk, of course, is that someone else will have loved the item enough to pay the asking price. There were so many beautiful things! There was a feeling of luxury throughout the sprawling residence. And the ultimate luxury at an estate sale: porta potties! I'm sorry I didn't take more interior shots to share with you, but duty called. I had shopping to do! What did I buy? Very little actually. I have better luck at estates sales in more modest surroundings. This was a nationally advertised sale, featuring higher-end items. I left with two fluffy bath towels, two hand towels, two boxes of candles, a set of blown glass vases that hold place cards, and a crystal wine bottle stopper. Tour of a unique estate in the West Tennessee countryside, FREE! Tell me about your estate sale experiences. Are there many sales in your area? Do you prefer auctions? Antiques shops? Buying new? I came back to add that this was a living estate sale. The homeowners are fine and living in Florida! Some sales do make me sad -- the ones that include the wheelchairs, walkers, and so one. This wasn't one of those. Even at those, I think, "At least the beautiful items will continue to be treasured." Susan of Between Naps on the Porch kindly invited me to link to her 155th Tablescape Thursday! Visit Susan and her talented participants HERE! There were some truly wonderful tablescaping items at the sale. Please never fail to visit the inimitable Suson of BNOTP for Tablescape Thursdays! For afficianados of imaginative, beautifully-laid tables, it's the happiest time of every single week! Hi Bill, What a grand place to have an estate sale, a bit like a National Trust property here in the UK. You got all that for £7.70 in sterling, sounds like a bargain to me. I look forward to seeing one or two in your tablescapes in the future, especially the set of blown glass vases that hold place cards!!! That would have been worth going just to tour the house. No I don't go to a lot of Estate Sales but maybe I should start. I want vintage items and so many I see are contemporary homes being cleared out. Beautiful home. Hope you show us more photos. Love touring homes, but haven't done any lately. OOh what an estate sales.. it was worth it just to go and look.. loving your photos and the shuttles.. goodness. So lately at estate sales I've found : white orchid flatware, glasses, linens, and my new to me cambridge epergnes. I try to go opening day and scarf up things that I can't live without and then go back for things I want a bargain. We do have quite a few estate sales in our area. We used to have an auction of things from Europe. However it has ended and that is sad. 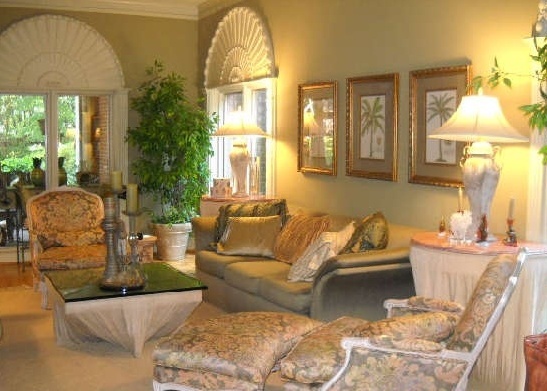 I did buy many of the furnishings for our home there. I prefer auctions but love estate sales! Have missed your presence in blogland.. Sounds like you got some great stuff for a great price. Ooooh Bill! I've never been to an Estate sale - they aren't the 'norm' in the UK. You've certainly opened my eyes to them now ;o) What a beautiful house and such gorgeous things...I'm amazed you could resist buying much, much more! Bill -- what a house -- most of the time I go to the estate sale to see the house -- purchases are a bonus!!!! I love the lamps on the dining room mantle!!! It is interesting sometimes for houses on the inside don't match the outside -- look nice outside look tired and dated inside but there are treasures from the 30's and 40's in those houses!!!! 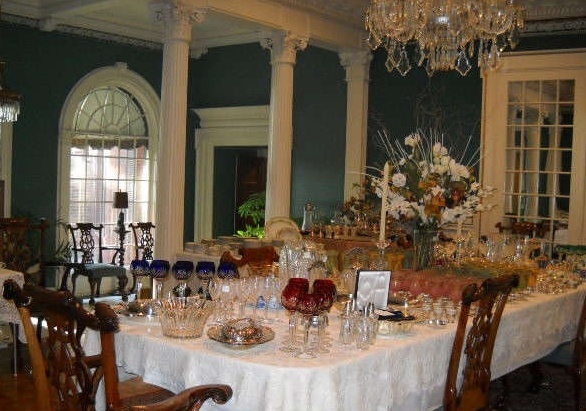 I've been in some of the nicest houses in Kansas City -- because they had an estate sale!!! What a great house, Bill, and what fun with all of the golf carts and special things they did for the crowds. I enjoyed the tour, and I think I would have jumped into that gorgeous pool. I loved he colored glassware, and I liked the leather pieces, too. I'm glad you found some things and at a good price! I don't usually go to estate sales because they kind of make me sad. Particularly ones that have lots of handmade things. I've been to some that looked as if the people had just stepped out of the room. It's sort of eery in a way, but I have friends who have gotten WONDERFUL things. One friend got all sorts of Herend pieces... like a whole set of Chinese Bouquet with all the serving pieces. Platters, covered casseroles, neat serving pieces. Then she had a lot of them displayed in her home, and I was in china heaven. LOL! I can't see that pattern without thinking of her. Seriously - that is a beautiful home and I suspect the majority was way out of my budget. Thanks for the tour. Sounds like you did get some good bargains. About the only thing I look for at the sales now are things I can use in repurposing jewelry, and have not gone to sales looking for that in a while now. It has been a very hot Summer and it takes a lot to get me out in the extreme heat. I am a wimp! :-D I don't care for auctions or ebay much as I like to see a price and either I will or will pay it and then move on. I also, don't like yardsales that don't have things priced, If I have to ask the price on every little thing I just walk off. I always enjoy your posts. I really enjoyed that Bill!..that would be so much fun, I probable couldn't afford anything either,but what a time I would have looking. That was fabulous to see! What a lovely place and there definitely were some high quality items in it! I can't believe you walked away so modestly! I've never been to an auction or estate sale. I'm imagining that home at Christmas with the piano being played, decorated trees, a crackling fire with a fabulous meal being served at that very grand table! Ahh....what a nice nice home that must have been to someone. 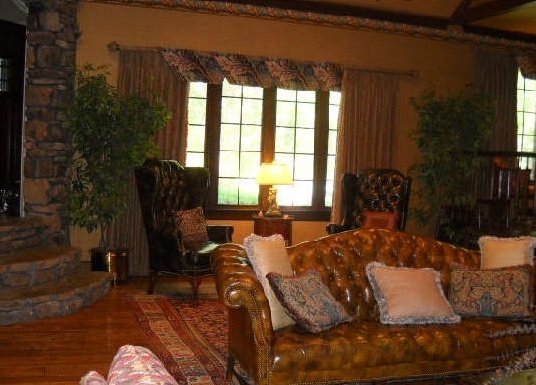 Wow Bill, I still can't believe that house filled with treasure was Estate Sale clothed, but I suppose when you're tired of it - you're tired of it! LOL! Thanks so much for sharing. That screen looked like a good deal - even at $395 ... I wonder who ended up with it? Lucky ducks! My WOW came before your typed WOW, Bill! Beautiful estate... and this "Hyacinth" could live there. LOL Just ask my hubby! And believe it or not his name is Richard! Loved seeing the house, and I too wish there were more pics as I love the inspiration! My affair with glass started 20 years ago with a box of Candlewick... I need to post about it one of these days. I had no idea what I had purchased at that estate sale... I just loved the sparkle even though it had been boxed for many years. Just something about those clear, crystal balls. My latest find is a pair of snack plates...(pics on my blog). in perfect condition! They were added to my collection of 85 or so sets. Mostly from the 50's but these were made 1938 - 1942.... and I love them! When driving through town on errands or whatever, I always stop and do a quick walk-through of several thrift stores along the way. Sometimes success, other times not so much. Oh my. What a place. Just to be there and soak it all in. It is funny, at the fancier sales there are fancier prices. All of that colorful crystal on the dining room table was captivating. Thanks for sharing this sale. Glad you came home with something. I like to go to the estate sales that are run by a particular couple. They have fair prices most of the time. I went to one this past weekend that was held by another dealer. It was sad for me because most of the picture frames still had pictures. Made wonder why the family didn't want the pictures.The house was run down. Maybe my expectations were high since it belonged to a prominent El Pasoan. There was a lot of El Paso history at the home but in my opinion the items were overpriced. thank you for taking us with you on this tour. I have never been on such a high end sale and it was realyy amazing. What a luxury of a house. Nice to hear that the owners are on good mood. I thought, maybe they had ruinated themself and need to sell now. That made me sad. But as you told us, everything is o.k. Unbelievable to sell such a house. Some pictures inside reminded me to your pretty house. Even if you purchased not a lot, I am sure, you left the house with many new tablescape-ideas und inspirations. Hi, Bill! Long time, no see! Well, I can't believe you got what you DID get for 12.50 at an estate sale like that! I would have thought everything would have been $100 each. Would you believe I've never been to an estate sale? I see signs all around here in CT, but have never been to one. When I was little, my mother loved antique shops (we lived in the city, so didn't have estate sales there) and then, by the time we moved permanently up here to CT, my Mom was too old to care about estate sales! And years ago, I don't know, we never SAW any 'estate sale' signs here on the weekends! So I am very naive when it comes to these things... plus intimidated too, since I don't know what to expect or how to act at an estate sale! If I ever go to one, I'll let you know! They would have had a difficult time removing me from the premises!! That place was divine! I LOVE Tudor styles!!! The grounds were as impressive as the house!!! I can't believe they had shuttle service & port. potties!!! Unbelievable! Hey Bill...I thought you might confess that you bought the house and were moving in soon (tee hee)! It is an amazing house. I trust we will some of your purchases in future? I absolutely enjoyed your tour of the estate sale. Fabulous glassware and rooms. My husband and I go to estate sales. Some are very nice hidden gems. We live in the poorest county in California and stuff gets well used here. 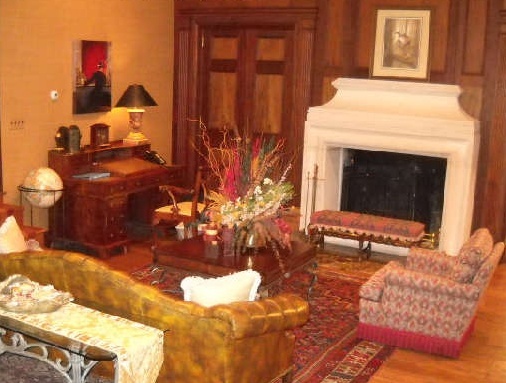 Once in a while a "richer" estate is offered. Such fun to tour the house for free! Why didn't you call me Bill! Lol. I jus did some vintage sales, we have an antique European shop that brings wonderful stuff, but no palacial sorrounding like this state you shared with us...I loved the tour and yes, all the glassware! Lots of hugs and a happy weekend. PS: Me, I would've bought the oriental screen! Wow! My favorite was the chandelier in the dining room. 2nd fav. is all that stemware. I would have gotten into major trouble at that sale, I'm afraid. Thanks for taking us along! What a beautiful home and how on earth were you able to avoid buying any of that crystal and china? I would be in deep trouble at that sale. Thanks for the tour. Being up in New YOrk, I don't get to go down south for these types of sales and home tours. OMGosh! I feel faint. I would have gladly bid on several things as soon as I walked in those doors. How marvelous to have the wherewithal to be able to afford such beautiful luxuries. Thank you for taking us on the tour with you. Their home is lovely. Wonder what the FL one looks like! Bill, this looks like it was worth the trip just to see this beautiful property. Thanks for taking us along. Hope you are having a good summer. Bill, I love your easy, breezy style...I felt like I was following you to the next room! Happy summer! Loved the tour! I could see myself living there....love estate sales. I haven't been to any since I have moved to Texas. I definitely would have gone just to see that beautiful house! Of course you should link up with this! Have you seen some of the things people link, that have nothing to do with tablescapes? There's one that links almost every week, a commercial site about tea and coffee etc! Very annoying. Loved the tour, would have loved to have been there. Your so lucky to have been there. Oh my goodness! I got excited just reading the first paragraph and when I saw that pool...I just can't imagine living like that! This would have been such fun and I'm afraid I might have spent way too much. You did really well holding back on the shopping. We don't have estate sales like that here...there are few homes like that one! What a gorgeous estate! All that glass would have caused me to have the vapors from pure excitement ! I'm sure the prices would have also. Bill, I was quietly saying, "WOW!" too! Such an amazing property with beautiful treasures. How I would have loved to have seen the stemware in person... I prefer auctions. My experience has been that estate sales are usually over-priced (at least on Day 1), and they're often too far away to go back the next day. But I've occasionally (even recently) had good luck. Thanks for the grand tour today. This was a treat! LOVE that pool fountain! This is stupendous! I would love to live thee!!!! T.T doesnt it just hurt? LOL great finds though! First time to visit your blog. What a wonderful sale. I would have loved to have gone as well.. but my favorite place to shop is at local auctions. Hi, Bill! Ramon & I are on the road this week, so my access to a (decent) computer has been limited. SO glad to finally see your post!!! That estate sale's advertising did NOT disappoint, did it? Wow! That is A-1, first-class all the way! A shuttle and port-a-potties??!??! I LOVE those people! They know how to do it up! The house is lovely, and all the gorgeous dishes and such would have sent me into cardiac arrest! What a great experience!!! It has been years since I have gone to an estate sale, but I would love to start going again. I agree that the 2nd day is always more of a bargain...if you're willing to take the gamble that what you loved will still be there. Sounds like you got some great bargains. Looking forward to seeing some of those beautiful items in upcoming posts. Hope you have a great weekend planned. Take care! Bill, I never knew there was that much money in Brownsville!!! I Lived in Jackson TN 2001-2004, off of Pleasant Plains...I often wonder if we were neighbors!! Oh what a gorgeous tour first thing this morning.I so enjoyed myself. I am right there with you friend. I could have seated myself in the shade by the pool, and just stayed right there, but duty did call. Loved the fireplace and that wing back chair, simply delightful. I could see you hands just brushing each piece of that stemware and your eyes all in a hurry to get to the next piece around the corner. Now are you tempted to go back and see what sells? I love traveling along with you.